It seems that every time I turn around and try to get back on track with posting about my projects something new happens that sidetracks that goal. Unfortunately this past month and a half or so has been something of the same. The good news out of all of this though is that I now have a full time job which will be funding some of my projects a whole lot better than my previous unemployed state did. One of the big things that has happened in the last month is that I have purchased a new power supply. 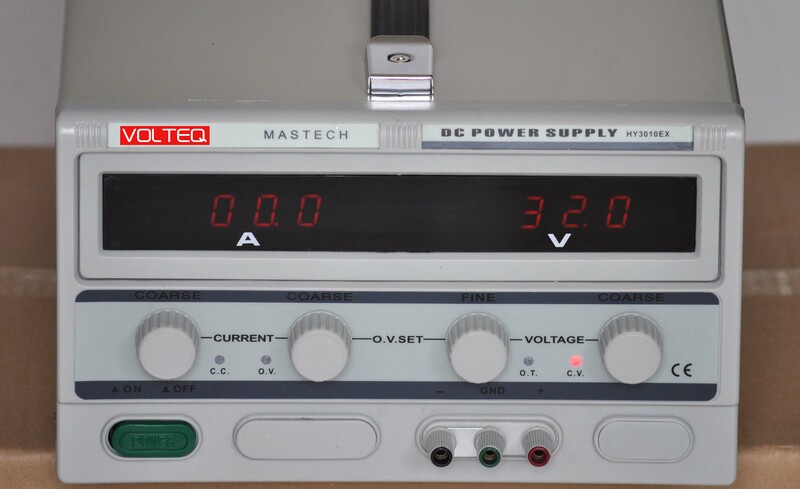 This power supply is from Mastech/Volteq and is capable of 30 Volts and 10 Amps. I have a lot of plans for this supply and will do reviews on it as I cover various projects. To give you an idea I’d like to try out some aluminum anodizing, I plan on using it to dial in power for a cutting laser I’d like to design, and as you can imagine I will use it for various other microcontroller related projects. Keep an eye out for these projects and thoughts about how the power supply performs. So far I’ve used it for a few microcontrollers and it has been rock solid. Lastly and most exciting to me is that I have finally completed my ShapeOko CNC build. Things were on and off as I was missing some parts and had a few issues along the way, but Edward, the creator of ShapeOko, was awesome all along the way and thanks to him I am up and cutting. So far I’ve cut a few bat symbols from plywood to dial things in and now I’m looking to move forward with cutting more complicated things as well as other materials. In classic fashion I’m also already looking into upgrades. I know it took me longer than it should have to put this standard kit together, but I’m already thinking a bigger work area is going to be necessary now that I have experienced true CNC power. So things I’m considering doing are: building a larger ShapeOko, building a laser circuit and a 3D printer extruder to use on my current ShapeOko, and continuing to look at various electronic setups while using the best features of each to create my own control board. These will probably be some long term projects, but like I mentioned once I started cutting things I can’t help wanting to go bigger and better. I’ve been in the market for a few new tool upgrades, but like most people out their I’ve been trying to get a good deal on those tools. 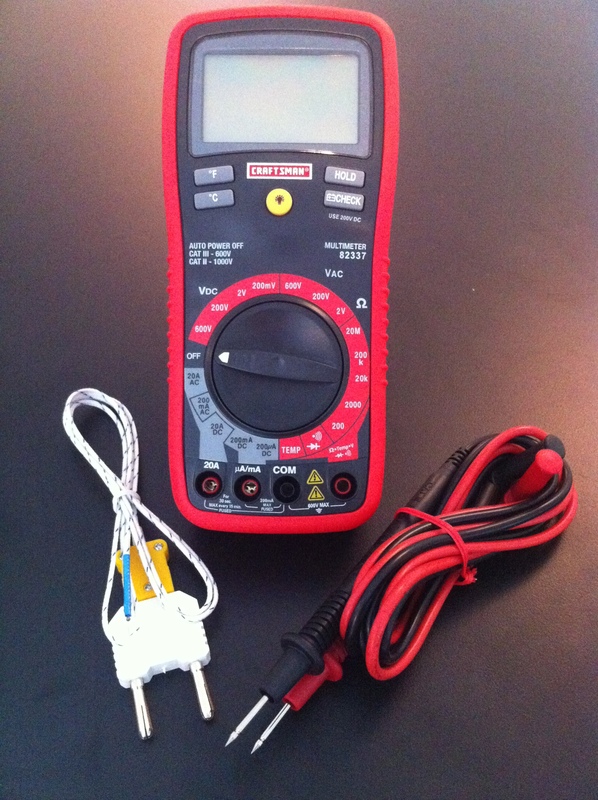 Well recently I found a great deal for one of the things at the top of my list, a new multimeter. For a while now I’ve been using a cheap multimeter from Harbor Freight and while it worked for most of what I used it for it definitely left a lot to be desired. Luckily for me the Sear’s Hardware store near my house is having a huge sale because they lost the lease on their building and are trying to offload a lot of product before they move. I heard that the sales prices were getting very low lately so decided to stop in and have a look around. I’m glad I did because they had just what I was looking for at a price I couldn’t pass up. The multimeter I purchased is a Craftsman Model 82337 as pictured to the right and while it’s obviously not a Fluke multimeter it does have a few features I was looking for. The three main things I was looking for in a new meter were that it be a bit more robust, have a continuity testing mode, and if possible it could measure temperature. This meter meets all of those requirements. It is larger and has a rubber casing around it as well as a larger more readable screen, the continuity testing mode has a very audible tone and is a feature that I’ve missed having very much, and the added temperature reading capabilities (with the included Type-K thermocouple) are great. I can even use this meter in a situation involving low light as it has a backlight that can be activated with the press of a button. Overall I am very pleased with this purchase and would recommend the meter to anyone out their looking for something nice on a budget. Factoring in the great deal I got on the multimeter I feel like it is probably one of my more valuable tools right now. You may be surprised that such a small upgrade has made such a big difference to me, but I got so used to using nice laboratory quality tools during my Master’s Thesis project that I’ve really been missing a quality multimeter, power supply, and oscilloscope at my desk. What about everyone else? Have you purchased any new tools lately that you’re excited about? What’s on your list to upgrade when you can? For everyone out there who follows the site I have to apologize for the lack of postings over the past two months. I’ve been a bit busy with some other things I have going on currently and my projects have been pushed aside a bit. That being said I’ve been able to start moving towards finishing a lot of things I have going on and I wanted to update everyone. It just so happens that my cleared up schedule coincided with and interesting challenge that’s been floating around the internet for a while. It’s called the Red Bull Creation Challenge and this year I am participating in the new format of the competition. The first round of the competition centered around a custom Arduino created by Red Bull and sent to participants called the Bullduino. 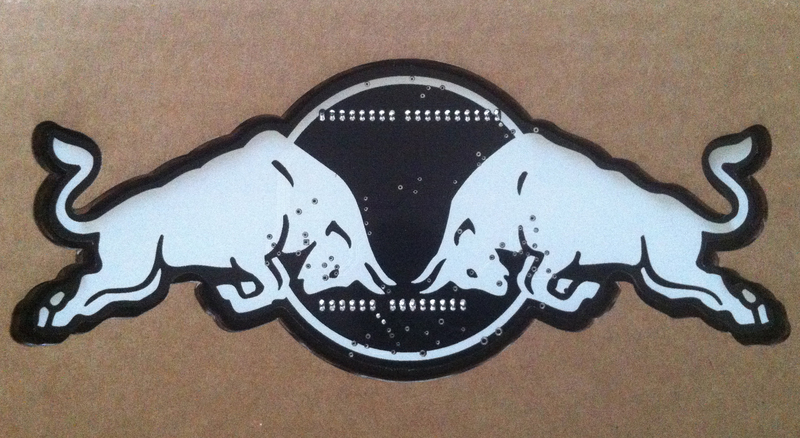 As you can see in the image it is a very cool board that is definitely designed to sell Red Bull. It gives me some crazy ideas for some of the boards I’m working on if I can find the right facility to create them. With my Bullduino in hand I set off to build a project for round one; what I came up with was the Red Bull Slushie Maker. I thought it was an appropriate project for the weather we’ve been having in Saint Louis lately as it’s been over 100 degrees for quite a while. If you’d like to see more you can check out my video entry to the contest here and over the next week or two I will try to document the project too. Hopefully I’ll make it to round two of the competition and really put my skills to the test against some of the top makers and hackerspaces in the country. 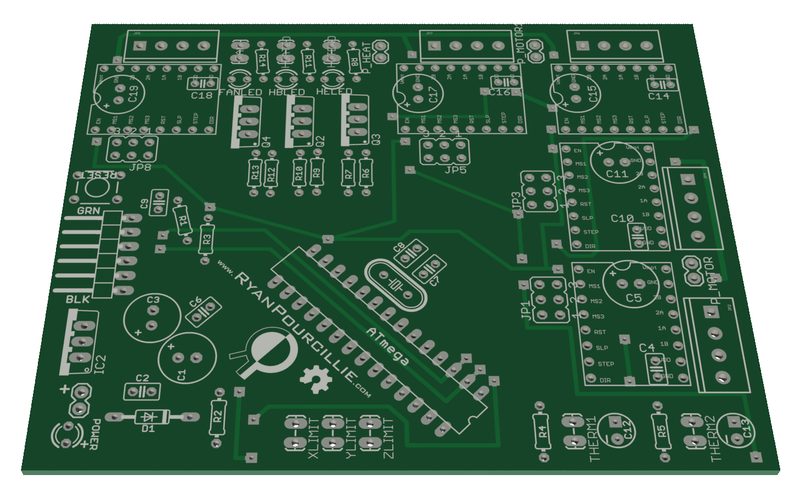 Having completed that project and having some fun with it I am now moving back into my ShapeOko build and PCB creation. Those two things have both been in a holding pattern as I’ve been in contact with Edward Ford the creator of the project. There was a bit of a mix up in my kit, but Edward has been working to take care of it and has been really awesome in the fact that he’s offered me some upgrades and extras for the additional waiting time I’ve incurred. I’m looking forward to seeing what he sends me and I’m definitely ready to get the build together finally. Once I have my ShapeOko up and running I’ll be able to test some of the PCB’s I have designed for CNC and 3D printer control. They are currently based around the ATMega328, but after some testing to make sure they function 100% I’m hoping to move forward and modify them to use some of the newer hardware that I’ve seen in the Arduino Leonardo. Once I’ve finished with that I think I will have some nice designs to add to the Open Source Hardware movement and potentially make CNC and 3D printing even easier to control. So that’s where things stand now, but over the next month you should be seeing a lot more posts and progress from me so stay tuned. As I mentioned in my last post I’ve been working on some changes to the site and my logo. I’m trying to clean things up and give everything a more polished look. I always want the things with my name attached to them to be as professional as I can make them. With that in mind I’ve made some more changes. If you’re reading this you will probably already notice that I have moved my blog page features to the homepage for easier and more streamline viewing. On top of that I’ve started organizing some better categories for my posts. Once I have made some progress on a few more of my projects I’ll be posting continuous status updates that you can find grouped in the corresponding project category. The second change will be more noticeable in the future or if you are following my channel on YouTube. As I mentioned previously I’ve created an introduction and some infographics for my video productions. Currently I only have one, but I’m looking to make more in the future and think the branding features will be nice for that. So if you’re curious stop by the link above and check out the new additions to my PCB Printer video. Aside from the changes I’ve made to the site I’ve also been busy developing a new project. As I posted in my last entry I purchased a ShapeOko CNC kit. Unfortunately there have been a few distribution setbacks so I’m still waiting for my kit to arrive, but with the down time I’ve been working on a side project for the ShapeOko. I’m planning on building the kit as is first, but I would ultimately like to expand the cutting area and possibly add a 3D printing option. With those two upgrades in mind I’ve been developing a control platform that can be used for each of those functions. I’ve made a lot of progress, but I’m still finalizing some layout issues and verifying EAGLE footprints. Hopefully in the next week or so I’ll be able to create a prototype board and begin the testing process with the stepper motors I have on hand currently. February and the beginning of March have been rather busy and I haven’t had a chance to post much to the site. That being said I have still been working on some things to improve it. Some of you may have already noticed, but I’ve added a bit to my logo and changed the site header. That’s where things started. I felt the logo before was too plain and wanted to add to it and I felt like the site header could be better as well. I don’t know that either change is perfect yet, but I like them better thus far. I’ll roll out a few more things relating to this logo change and a new video introduction I’m working on in the near future so keep an eye out. As for projects and progress. I hate to say it, but I haven’t made much progress on my short-term projects lately. I have a few circuit board designs I’m working on sporadically, but the majority of my time has been focused on trying to find a job. With that being said I have recently shifted my project plans to focus on one of my long-term goals. That goal is putting together a CNC machine and I am slowly making progress on it. I’ve had the electronics to build such a system for a while now and recently purchased a ShapeOko kit. I went with this kit because I think it has a lot of promise. The community behind it seems motivated and helpful so I feel as though assembling it is well documented and seems simple to do. My biggest reason for purchasing it however is the possibility of expansion that it presents. I have a few ideas for upgrades in the future and I’m excited to get the kit and start on phase one of the build.